نورمحمدی, غلامحسین, فضلوی, علی, آبایی, الهام, کریمی, غلامرضا, رحمانی, علی اکبر. (1394). حذف یون مس از پساب با استفاده از نانوجاذب بنتونیت مگنتیت سنتزشده. مجله آب و فاضلاب, 26(5), 106-109. غلامحسین نورمحمدی; علی فضلوی; الهام آبایی; غلامرضا کریمی; علی اکبر رحمانی. "حذف یون مس از پساب با استفاده از نانوجاذب بنتونیت مگنتیت سنتزشده". مجله آب و فاضلاب, 26, 5, 1394, 106-109. نورمحمدی, غلامحسین, فضلوی, علی, آبایی, الهام, کریمی, غلامرضا, رحمانی, علی اکبر. (1394). 'حذف یون مس از پساب با استفاده از نانوجاذب بنتونیت مگنتیت سنتزشده', مجله آب و فاضلاب, 26(5), pp. 106-109. نورمحمدی, غلامحسین, فضلوی, علی, آبایی, الهام, کریمی, غلامرضا, رحمانی, علی اکبر. حذف یون مس از پساب با استفاده از نانوجاذب بنتونیت مگنتیت سنتزشده. مجله آب و فاضلاب, 1394; 26(5): 106-109. هدف اصلی این پژوهش جذب یون‌های فلزی مس از پساب با استفاده از نانوجاذب بنتونیت مگنتیت سنتزشده (20 تا 30 نانومتر) بود. ابتدا نانوجاذب به روش هم‌رسوبی تولید و با روش‌های SEM، XRD و طیف‌سنجی مادون قرمز تبدیل فوریه (FT-IR) آنالیز و ارزیابی شد، سپس به‌عنوان جاذب در تصفیه پساب مورد استفاده قرار گرفت. آزمایش‌ها توسط نرم‌افزار DOE طراحی و ارزیابی شد. مهم‌ترین مشخصه‌هایی که بررسی شدند شامل مقدار جاذب، زمان تماس، غلظت یون فلزی و pH بودند. 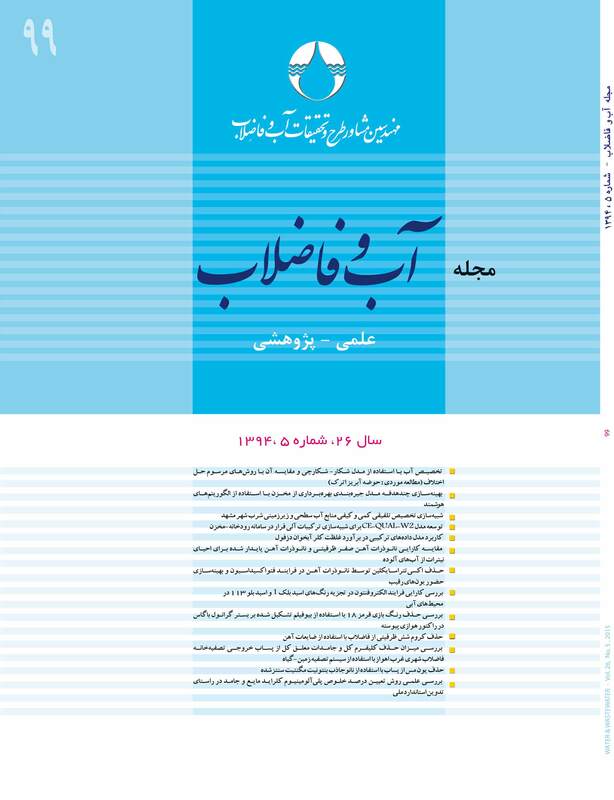 در ادامه به‌وسیله مدل طراحی CCD ، شرایط بهینه برای بهترین مقدار جذب (حذف) یون فلزی پیشنهاد شد. راندمان جذب یون فلز مس 94/89 درصد به‌دست آمد. سرانجام با تعیین شرایط بهینه بر روی پساب معدنی (معدن مس سرچشمه) آزمایش‌های مورد نظر انجام شد. نتیجه بیانگر جذب یون مس به میزان 30 درصد بود. The objective of the present study was to investigate absorption of copper from wastewater using the synthesized magnetite (Fe3O4) bentonite nanoadsorbent. Synthesized magnetite-bentonite nanoparticles (20‒40 nm) were produced using the coprecipitation method and subsequently subjected to Scanning Electron Microscopy (SEM), X-Ray Diffraction (XRD), and Fourier Transform Infrared Spectroscopy (FT-IR) for analysis and evaluation. The nanoparticles were finally used as an adsorbent in wastewater treatment. Experiments were also designed using the Design of Experiment (DOE) software. Absorbent quantity, contact time, Cu+2 concentration , and pH were the most important factors selected for investigation. In a second step, the CCD design model was used to identify the optimum conditions for achieving the best metal ion absorption (removal) efficiency. It was found that 89% of Copper metal ions were absorbed under optimum conditions. Finally, experiments were performed on the inorganic effluent (from the Sarcheshme Copper Mines) under the optimum conditions. Results revealed a sorption content of 30% for Cu2+..
1. Li-na Shi, Xin Zhang, and Zu-liang Chen (2011). “Removal of chromium (VI) from wastewater using bentonite-supported nanoscale zero-valent iron.” J. of Water Research, 45, 886-892. 2. Shahwan, T., Üzüm, Ç. A.E., and Eroğlu, I. (2010). “Lieberwirth synthesis and characterization of bentonite/iron nanoparticles and their application as adsorbent of cobalt ions.” Applied Clay Science, 47, 257-262. 3. Panneerselvam, P., Norhashimah, M., and Kah Aik, T. (2011). “Magnetic nanoparticle (Fe3O4) impregnated onto tea waste for the removal of nickel(II) from aqueous solution.” Materials, 186, 160-168. 4. Badruddoza, A. Z. M., and Uddin, M.S. (2011). “Carboxymethyl--cyclodextrin conjugated magnetic nanoparticles as nano-adsorbents for removal of copper ions: Synthesis and adsorption studies.” J. of Hazardous Materials, 185, 1177-1186. 5. Luiz, C.A., Rachel V.R.A., Riosa, D., Vijayendra, K., and Rochel, M. (2003). “Clay–iron oxide magnetic composites for the adsorption of contaminants in water.” Applied Clay Science, 22, 169-177. 6. Namdeo, M., and Bajpai, S.K. (2008). “Chitosan–magnetite nanocomposites (CMNs) as magnetic carrier particles for removal of Fe(III) from aqueous solutions.” Colloids and Surpaces, 320, 161-168. 7. Kusmiyati, K., Aishah, N., and Saidina, A. (2004). “Application of central composite design (CCD) and response surface methodology (RSM) in the catalytic conversion of methane and ethylene into liquid fuel products.” Fundamental Science Seminar, University of Tech., Malaysia. 8. Mardani, R., Ebrahimi Zarandi, J., and Kashesh, M. (2010). “Biological filtering investigation of sarcheshmeh mining acidic water on base discontinues reactor usage.” Science and Environmental Tech., 3, 35-44.